Where does the self end and the self of our closest loved ones begin? Boris Greiner thoughtfully and philosophically explores the deep, inner workings of intimacy from the perspective of one half of a couple in this excerpt from his novel, Ona i On (2013) (She and He). Boris Greiner, born in Zagreb in 1959, is a multi-faceted artist whose reach across the art, literature and film scenes in Croatia is extensive. He is the author of seven published books, the director of ten experimental films, and has performed in over twenty solo exhibitions and performances. He was a member of various well-known artist collectives for many years. 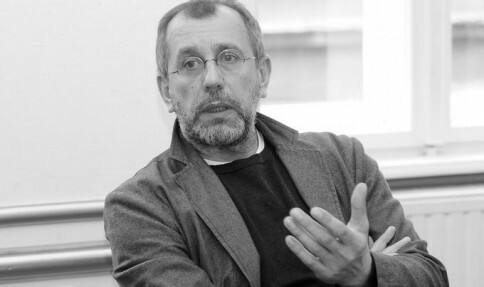 His published literary works include: Interkonfidental (with Stanislav Habjan) (1999); the novel, Pješakov gambit (2003) (Pawn’s Gambit); the collection of short stories, Život na tavanu (2007) (Life in the Attic); the novel, Tajni agent Gan Flint (2012) (Secret Agent Gan Flint); and the novel Ona i On (2013) (She and He). Read an excerpt from Greiner’s novel, She and He (2013), below. Translation by Sandra Jubašić. She knows too much. She knows exactly what he thinks. What other explanation could there be for her reactions, for her words answering his thoughts. At a given moment it sounds natural. Fluid. Yes, that’s what he meant. But then it strikes him. ‘Wait a minute,’ he says to himself ‘I never told her that’. And she, not only is she unsurprised by his thoughts, but she seems to have accepted them and reacted to them already as if that was no big deal. ‘I should be more careful or not think those thoughts,’ he thinks to himself, ‘I should simply think different thoughts’. When you think about it, is that not the universal solution – to simply think different thoughts? Then when she asks him, like she did yesterday as he was sitting on the terrace, ‘What are you up to?’ he’ll answer ‘I just remembered everything’. And they will laugh. But when she casually follows up with ‘what is it that you remembered,’ and he tells her… He may have been wrong to tell her. He should have kept it vague: ‘You know, things’. She may not have known, and he would have felt victorious, because sometimes it’s about winning. Not because there’s a constant battle being waged. Or perhaps there is. It’s not a matter of life or death, though. Or perhaps, on a non-existant plane, it is. Knowing everything isn’t good for her either. Who could live with that? Whether he does the washing up after lunch or not is irrelevant, what matters is that he does it differently, in a style that appears no different, when it actually is. Because it’s important for him to keep his world to himself. This world might be what keeps her coming, what draws her to him. A world in which he can freely indulge in internal musings about a different way of thinking, with possible dividends of unplanned victory on that non-existant plane. She’s suffering from stomach cramps and feeling queasy. There’s been a veil between her and her surroundings all day. She went trouser shopping downtown this morning. She texted him: ‘Should I get these?’ She didn’t. Next stop, the market. She felt barely present the entire time. It wasn’t that she was barely present, it was that everything felt blue… And the feeling dragged on indefinitely. In bed that evening she pointed at a spot below her throat, ‘I feel it, right here’. If only the shop assistant had done something, given her a nod, she would have got the trousers. She thought some wine after lunch would break the spell, raise the veil that had descended on her. It helped for a while, but there the veil appeared again, descending. Afternoon – indigestion and cramps. They talked a while in the evening; she was doing better she felt like, but as soon as she sat up straight, she would feel dizzy. ‘Half past midnight,’ she said. ‘We’d best go to bed; it might be gone by tomorrow morning’. He smokes when he writes. She believes he uses writing as an alibi for smoking. He does, in a way, but that’s his private thing, it can’t be subject to irony. It’s never discussed. What was he to do, now that everything had been said out loud. His plan fell through, and he can neither stay nor go. They lay in each others arms, she about to fall asleep, he with his cover blown. He saw that as a pool of potential ideas. It would be like going down an inexhaustible well – she would say whatever came to her mind, he would write a short story about it. His mind started to wander; she may say ‘trousers’. ‘A blue veil’ maybe. That could work. Blue veil. He’d open with a storm – the laws of existence, the illusion of certainty, man building, creating, making sense of his surroundings, building a set of values; then lightning would strike – the end, man knocked out of his orbit, wandering aimlessly like Winnetou, shot out of himself like a silver bullet from a blue gun, ocean surrounding him, the blues surrounding him, shot out into the unknown like the Apollo or the Sojuz… ‘That could work, who knows what she’ll come up with. She hasn’t fallen asleep yet, has she?’… He envisioned himself working each night, half past midnight to half past two… an invisible thread – the infinite pool of ideas sets no limitations. But where luck calls the shots and critics deliver the verdict… A podium, a tuxedo – why not – he, emerging from the depths of the auditorium, taking his time, the curtain rising, a glass of water… Her voice interrupted his fantasy. On the one hand, he is often wrong. Although that’s when he is quickest to insist that he’s right. We probably all are. The following day he realizes he was wrong. He feels dumb. He admits to her that he was wrong. On the other hand, she must often be wrong as well. She is equally as quick to insist that she’s right. By the logic of things, the following day she should realize she was wrong. And she should feel dumb. Then she should admit to him that she was wrong. But her take on it is different. She somehow gets on his good side, gently, and says nothing. On the one hand, her take on the matter is better because it makes more sense – yesterday’s argument is already in the past. It no longer matters, why bring it up again? On the other hand, he can’t ignore the feeling that it’s actually about her establishing dominance. People with a need for dominance never own up to their mistakes. She thinks she is more dominant in general. She gives him an example to prove it. She sticks out her tongue and rolls it into a tube. She says that’s a characteristic of a dominant personality. She has a long tongue, it’s easy for her to do it. Now you try, she says. He can’t do it. His tongue is short and thick. On top of that, it’s fissured, with deep groves all over. He doesn’t like to show it, it’s not much of a tongue. On the one hand, it doesn’t matter what a tongue looks like. On the other hand, it’s better to have a long and smooth tongue, no doubt about it. He should think of another example, of something where he has the upper hand. But what could that be? What could beat the tongue? That bothers him in general. She keeps finding things she’s better at, but if he does the same, she dismisses his as irrelevant. He knows what the real issue is. Who has what is irrelevant; the point is that when she says her tongue is longer and therefore she is more dominant, he should say yes, you are right, you are more dominant. But when the argument arises, he’s caught off guard and takes the bait – if only his tongue were long too. When actually he should remain indifferent. He takes it personally when she says she’s tired. Not that he doesn’t believe her, but he wishes she weren’t tired at that exact moment. It doesn’t fit his idea of their immediate future. Besides, he can’t be sure that she isn’t tired because he has started to bore her. He stays at her place. At first he would sleep over occasionally, then occasionaly became frequently, and now he’s there almost constantly. Maybe he should leave from time to time, that may even be expected of him. Maybe that is what she’s hinting at when she says she’s tired. She may be doing it unwittingly, maybe she feels it deep down in her core. She just doesn’t know how to express it. She dozed off and he’s pondering his stay at her place. Why should he struggle with interpreting hints; why not wait for her to explicitly say she wants him to leave for a while? Because hearing her say those words would crush him and hurt his pride. But if he managed to swallow his pride, if he remained unphased by her throwing him out, he could just leave. No tail between his legs, no sorrow in his face, not a hint of pain. That lack of reaction would pay dividends on the emotional plane. On that delicate, intimate plane where they, like all other couples, wage a battle for dominance. She wouldn’t win then, the ball would roll back into her court… He wouldn’t be hurt, he would simply head out… Still at the door, she’d already be asking him to change his mind, to stay. Knowing that he’s unable to swallow his pride, he concludes that leaving of his own accord is the only way to collect those emotional dividends. The problem is, he doesn’t feel like leaving.